The Beatitudes (Matthew 5:1-12) are the essential teaching of Jesus. Recorded in the gospel told by Matthew, within the larger section of the Sermon on the Mount (Matthew 5-7) they have always been taken seriously in the life of the Church but along a line ranging from literal to metaphorical, from concrete pragmatic directives to poetic unrealistic hopes of how heaven is. They present an inherent tension between now, and what is to come, as each beatitude contains the first verb in the present tense, with a dependent clause articulated in the future tense. Jesus speaks to a crowd made up of his disciples and other people who had come to him for social acceptance, healing, and deliverance. Here in 5:5 Jesus talks of those who The word for meek [praies] in Greek means humble, lowly, meek, gentle. It doesn’t imply timidity, passivity, wimpishness, weakness or cowardice. Rather it evokes a strength that is gentle, an expression of power with reserve, a patient centeredness in which one places one’s hope in God. The words of Jesus echoes the promise, repeated three times, in Psalm 37 that the meek, those who place their trust in God not in their own power or the powers of the world, will be blessed. The apostle Paul, in his pastoral letter of advice to the church in the highlands of ancient AsiaMinor (now Turkey) called Galatia. Paul talks of the fruits of a life that rejects God, and those that are centered in the Divine Spirit. It’s commonly called the “Fruits of the Spirit”. Meekness [praies] figures in that list of characteristics of a Spirit-centered life, against which Paul says there is no law, or equal power. Jesus calls the meek “blessed” [μακάριος] which we could also translate as a declarative “congratulations!” Some scholars lift up the dynamic momentum underneath the word which is not just an adjective, but a verb: call to action and engagement extended to those who don’t usually see themselves as actors worthy, capable and needed to participate in the transformation and redemption of the world. In that line of thought μακάριος could be translated as “Let’s roll!” “Get up! 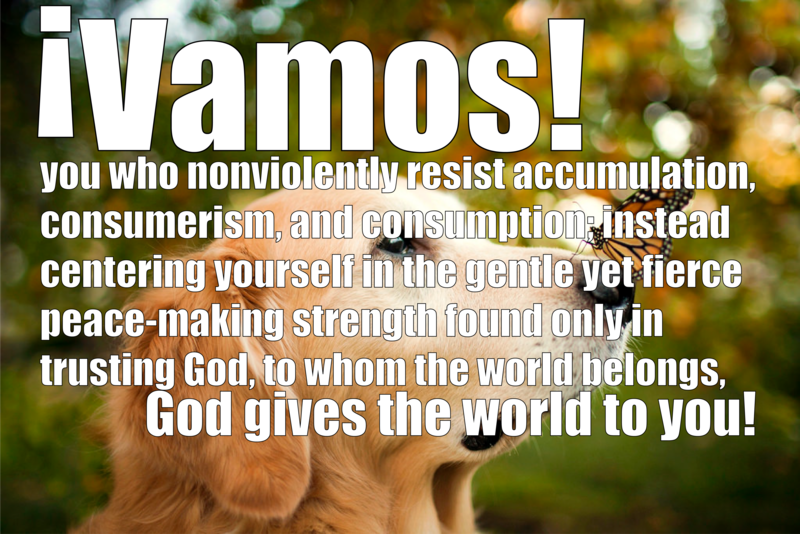 Get going!” “Let’s do this thing!” or the common Spanish expression “Vamos!” Jesus then is calling those who follow him, those who think they are nothing to a radically new way of thinking, being as well as doing and living. How do you hear and react to the word “meek”? How is this teaching of Jesus contrary to the understanding of power & importance in our world? How do you struggle to see yourself as important, called by God to be part of the divine plan for the universe? Where do you glimpse this truth of Jesus at loose in the world, making all things new? Download the Study Text Sheet that we use @CAPCOakland HERE.